When you head out for a long run, many things go through your mind. You think about good running posture. You also think about how to bend your arms, how to pace your strides and to improve on your previous time. All those will help you to have a good run. 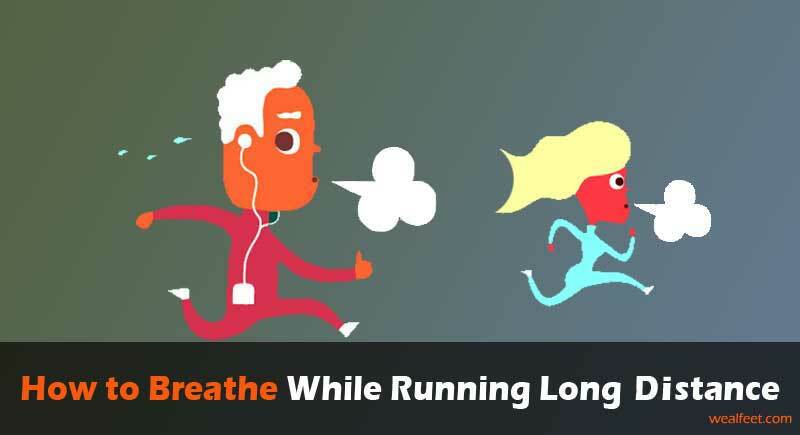 You also need to know how to breathe while running long distance. Ever noticed how experienced runners glide during long runs without much effort? This is something that is within your reach. Experienced runners run in a 2-2 pattern meaning they breathe in for two steps and breathe out for two steps. This kind of breathing enables you to maximize your oxygen intake. You need to vary your pattern. Breathing in a 2-2 pattern is likely to cause injury due to constant stress happening on one side of your body. If you exhale while landing on your left foot, you are likely to get injured as a result of stress on that side of the body. Coordinate your breathing by landing on a different foot each time you exhale. This will enable you to run long distances well without the threat of getting an injury like plantar fasciitis or heel pain. Alternating your breathing and steps enables your body to share the impact of running. For easy running, you can also try a 3-2 breathing pattern and 2-1 when running faster. Learning how to switch from one pattern to the other will also enable you to adjust your speed as desired. This results in better breathing that helps you run long distances. You need to breathe out air out to allow fresh oxygen to rush back in. You can manage this with a 3-2 breathing pattern. Creating the right breathing pattern may seem like a complicated process. You cannot master it in one session of running. You need to keep practicing and working on creating your breathing technique. Learn to breathe from your diaphragm as opposed to doing so from your chest. Breathing from your diaphragm enables your lungs to expand so it can absorb the largest amount of air. You need much air for you to run long distance. The more air you are able to inhale, the longer you will last and run. Start by counting in your head during the time you are warming up for your run. You can then progress by repeating the same process during your long run. Learn to breathe through your mouth while running. This allows you to take in more oxygen to your body than when you breathe through your nose. Constant practice is the key to creating your breathing pattern. Your mind is a powerful tool that is able to grasp what you keep learning. The mind plays a significant role during long distance running. It feels good to realize you are running and breathing in tune with what you have practiced and learned before. There is much more to breathing than exhaling and inhaling of oxygen during a long run. You need to find and create your rhythm that works well for you. Paying attention to your breathing patterns will determine how you train and run. When you inhale, your diaphragm expands and allows your lungs to take in a great amount of air. A breathing pattern enables you to draw air into your body through focused breathing. The pattern gets complete when you are able to control how you breathe.This is what results in rhythmic breathing pattern. Rhythmic breathing allows you to connect your mind, body and spirit together. This connection makes it possible for you to have control over your physical body. When you achieve this connection, you are able to run long distance. Running a long distance needs calmness. Relaxing enables you to gain control of the stress that inhibits your performance. Staying calm allows you release tension from your mind. It also helps you to launch on autopilot. Running results into a rise in body temperature. The heat produced increases your breathing rate. It is like driving a car for a long distance without having water which is a cooling effect. The same applies to your body when you run without drinking enough water. Taking enough water helps your body to cool itself thereby allowing you to breathe well. Breath gives life. The same applies to your running. Aside from breathing the right way, you also need to consider taking time off to recover. Time off from running enables you to avoid getting injured. When you get injured, you lose quality training time which can affect your progress in all areas. Remember, staying fit is easier than sweating to get fit. As you tune your mind, body and spirit during your running, you will run in complete harmony. To achieve this, you need to master and gain full control of your breathing. As a long distance runner, you need to gain control of your body movement. Breath control enables you to be in tune with your arm swing, stride, and pacing. Taking deep breaths is the key to an effective breathing technique that enables you to run for long. Don’t get frustrated by experienced runners who have already mastered how to breathe while running long distance. Take courage. Perhaps you can learn and gain valuable lessons from their experience. Seek to learn from them. Moreover, continue working on every lesson you learn. Give it a try, will you? Besides, practice and constant learning will turn you into a better long-distance runner.